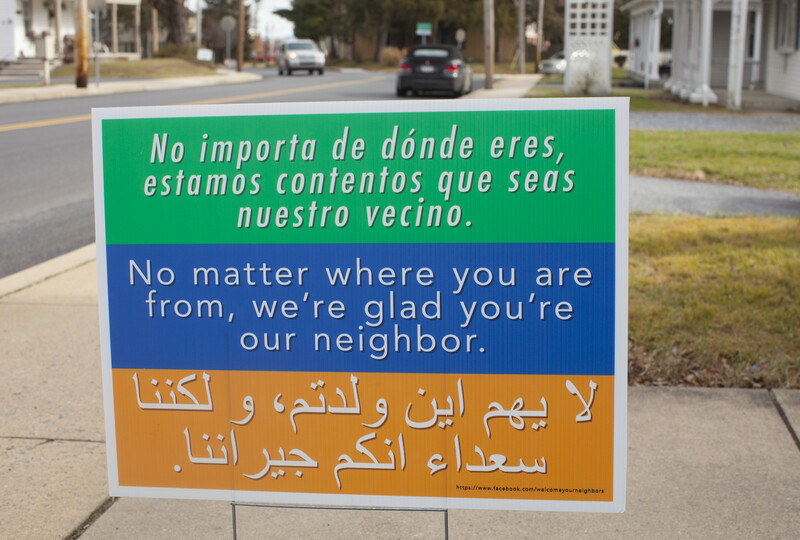 Examples of individuals and communities welcoming immigrants: Harrisonburg, Virginia; Lancaster County, Pennsylvania; Mancos, Colorado; and New York, New York. Safe third country: The Trump administration and members of Congress are reportedly looking at granting Mexico "Safe Third Country" status, which would force Central American refugees traveling through Mexico to apply for asylum there and effectively block them from entering the U.S. Ironically, groups in Canada, including the Canadian Council of Churches, are suing to remove the "Safe Third Country" designation for the U.S.
U.S.-Mexico border: The House passed a budget bill funding $1.6 billion in new border wall construction (August recess toolkit). More funding will be needed for eminent domain lawsuits to seize private land in Texas. Preliminary preparations for construction are already underway at some sites. Proposals for a "solar wall" are meeting criticism: Vox | Popular Science. A desert aid camp is now turning away migrants after a border patrol raid. DACA/Dream Act: Ten state attorneys general are threatening to sue the Trump administration if the Deferred Action for Childhood Arrivals (DACA) program is not ended by September. It is unclear whether the administration will defend the program in court. On July 20, the Dream Act was reintroduced in the Senate, which would protect the nearly 800,000 DACA recipients and many others. Refugee/travel ban: A U.S. Supreme Court ruling on June 29 allowed the Trump administration refugee and travel bans to go into effect provided they did not exclude those with "bona fide" relationships in the U.S. A subsequent ruling on July 19 clarified that those relationships must include grandparents, grandchildren, brothers-in-law, sisters-in-law, aunts, uncles, nieces, nephews, and cousins. Contact with a refugee resettlement agency is still not considered a "relationship." Detention: A federal judge found that unaccompanied children seeking asylum are still being detained too long, in violation of a long-standing court agreement. A new hunger strike began at the Adelanto Detention Facility in San Bernardino County, California. A new law in California bans new immigrant detention centers. Photos: Inside the Northwest Detention Center in Tacoma, Washington. Farmworkers: Rep. Goodlatte (R-VA), chair of the House Judiciary Committee, plans to introduce a bill to expand the number of guestworkers in the U.S. but also remove many labor protections. An amendment to a House budget bill would expand the current guestworker program without offering a path to legalization for the estimated 1 million undocumented guestworkers. Read more. Welcoming the newcomer: In the current climate of fear and unrest surrounding immigration, MCC is finding ways to welcome our neighbors in northern Indiana and Chicago. 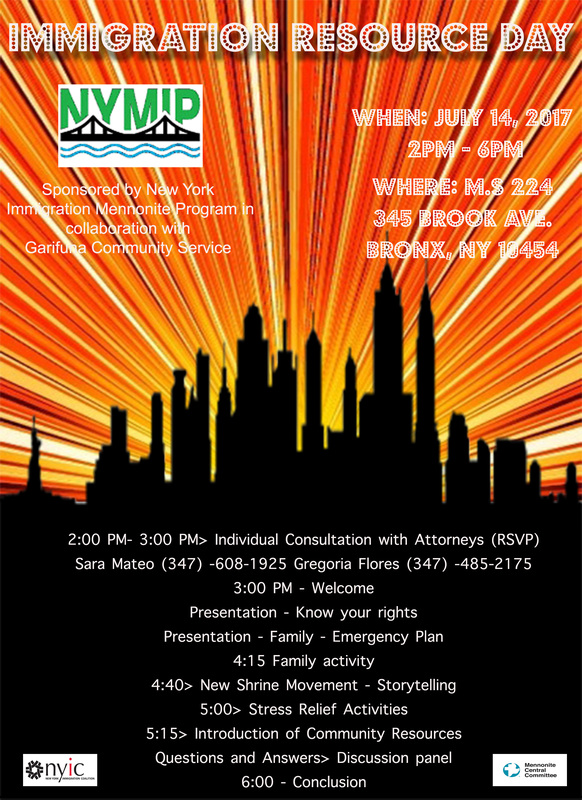 On July 14, the New York Mennonite Immigration Program held an "Immigration Resource Day" in the Bronx, New York. To inquire about future events in the New York City area, contact HyacinthStevens@mcc.org. Update created July 31, 2017, by Tammy Alexander, Senior Legislative Associate for Domestic Affairs.